Find out if your domain has an evil twin with the Domain Doppelganger tool. Our NEW Domain Doppelganger makes it easy for you to identify your potential 'evil domain twins' and combines the search, discovery, reporting, risk indicators and end-user assessment with training so you can take action now. With your look-alike results you can now generate a real-world online assessment test to send to your users. Get the results to see what your users are able to recognize as “safe” domains for your organisation and understand how security-aware your users are when it comes to identifying potentially fraudulent or phishy domains. We will email you a summary report PDF that contains an overview of the look-alike domains and associated risk levels discovered during the analysis. 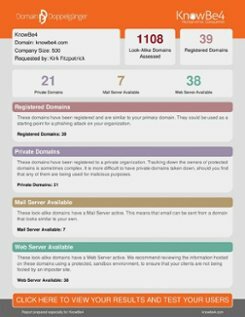 You will also receive a link to the full detailed report of all look-alike domains found similar to your primary email domain. It only takes a few minutes to discover your “evil domain twins”! We will endeavour to send you this report within one business day. Required data for domain doppelganger: We need a valid email address from the domain of your own organisation, so Gmal, AOL, Yahoo or any other ISP cannot be accepted.